China’s news launch vehicle, Long March -7, will carry a scaled-down version of a next-generation Chinese human spacecraft on its inaugural flight in June. The top of the capsule, seen in designs and apparent development above, packs parachutes, GNSS antenna and antenna specially designed to prevent radio silence during hypersonic re-entry…. The successor to the currently-used Shenzhou spacecraft – the 11th mission of which will take two astronauts to Tiangong-2 late this year – will be made from advanced aluminium alloys in order to reduce the vessel’s weight to allow more crew and cargo. While Shenzhou re-entry capsules return to Earth and touch down on land at Siziwang Banner in Inner Mongolia, the new capsule can also be recovered at sea. It has not thus far been stated if this capability will be tested in June…. Zhang Bonan, chieft designer of the Chinese space station, told CCTV that the second-generation spacecraft could be developed quickly if approved by the state. The conical spacecraft is similar to the American Orion and Apollo capsules and would be capable of carrying between two and six crew members. 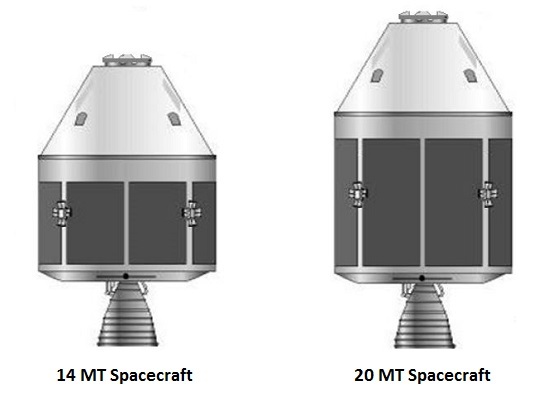 The capsule would be attached to service modules of different sizes depending upon the mission. The baseline spacecraft would weigh 14 tons, with a 20 metric ton version featuring a longer service module. The vehicles would be used to support near-Earth, asteroid, lunar and Mars missions. The new spacecraft would be launched aboard Long March-5 and Long March-7 rockets due to their increased weights. China is currently flying Shenzhou spacecraft that are similar in appearance and size to the Russian Soyuz transport. The Shenzhou is capable of carrying three crew members. Sounds like a Chinese equivalent of Orion. But at the fraction of the price. Where is the Capsule Fairy that is handing out all these? She’s visited the US 3 times (4 if you could Blue), and Russia/India/China once each. She gets around. First they copied Soyuz. Now they copy Apollo?!? Why is it that Dragon weighs half (or less) of all other contemporary capsule designs?. Apollo has always been a compromise regarding the interior space. I would consider SpaceX Dragon as far superior. At present China is years behind current US designs and once the new chinese capsule flies it will be behind a manned reusable Dragon again. Especially if this Dragon features powered landings. they developed solid fuel and never had decent control even in short distance. Americans developed liquid fuel , dr. goddard, and america, and russia, developed rocket controls.